Today, I delivered my presentation at the EuroIA 2010 in Paris on the relation between my two passions: gastronomy and user experience design. FoodUX served its purpose as a collection of background materials for the presentation. In future times, I will keep maintaining @CompCook as much as possible. So, keep tuning in once in a while. “A crazy topic with a scary video clip of a positive eating experience”, I said in my impersonation as Lars Von Trier! 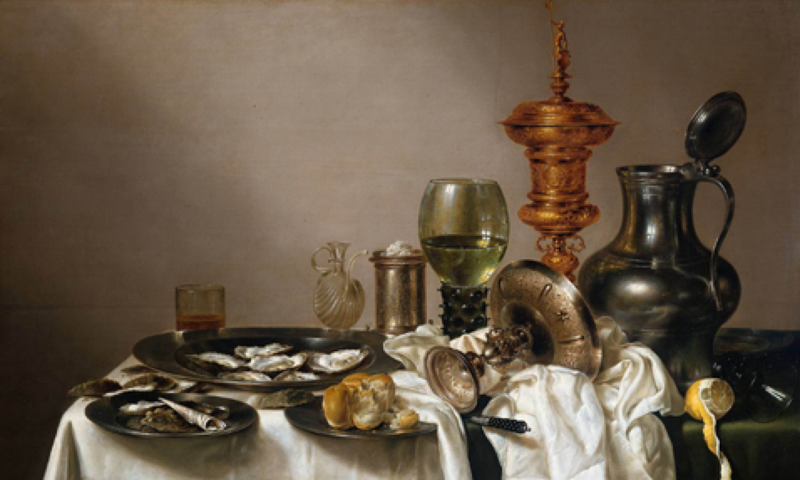 Taste is a very important driver of the eating experience and a complex human phenomenon. It has been a topic of scientific research and philosophical discussion. The mission of the Taste Science Laboratory in the Division of Nutritional Sciences at Cornell University is to elucidate the nature and impact of individual differences in perception – in particular, differences in taste and smell sensitivity – on personality, performance, and preferences. In its first definition, the American Heritage Dictionary limits the tastes perceived by the taste buds to four: in fact there are at least six in addition to the classic four, there are the taste of fat, and a taste called umami. Umami means delicious in Japanese, and is the word for the savory taste of meat. In this way, our taste buds are designed to tell us about the nutritional qualities of the food we eat: sweet for ripe fruit and carbohydrates, sour for unripe fruit and vitamin C, salty for salt and other minerals, bitter for poisonous plants, umami for protein, and fat for fat! The second definition, which includes smell and touch, is the one most people have in mind when they talk about the taste of a food; taste, in this sense, means flavor. As part of my holiday reading list, I purchased Making Sense of Taste: Food & Philosoph by Carolyn Korsmeyer. Really looking forward reading it. Just when Catalonian chef Ferran Adrià announced that his world famous restaurant El Bulli will be closed permanently, another Spanish chef takes center stage. During the 8th international gastronomy summit, MadridFusión, world renowned Michelin star chef Juan Mari Arzak of the famous Arzak restaurant in Spain and Philips Design presented a series of concepts intended not only to delight palates, but also evoke emotion and stimulate the senses. The sensual enjoyment of flavors, the appreciation of harmonies and the recognition of nuances all combine to create the unique pleasure of the dining table. In its latest Design Probe – Multi-sensorial Gastronomy – Philips Design has explored how the integration of light, conductive printing, selective fragrance diffusion, micro-vibration and a host of other integrations of sensory stimuli could affect the eating experience in subtle ways. Lunar Eclipse (bowl), Fama (long plate) and Tapa de Luz (serving plate) are made from bone china and familiar objects from our everyday lives. However when liquid is poured into the bowl or food is placed on the plates, they begin to shine. A glowing light subtly appears from the bottom of the bowl and plates creating a new sensory dining experience as the senses are stimulated and altered. The series uses bone china and involves the integration of lighting, conductive printing, selective fragrance discharge, micro-vibration, electro stimulus and a host of other sensory stimuli that affect the food and the diner in subtle ways. 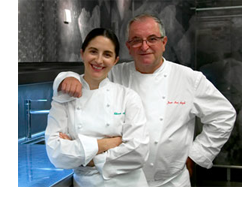 Also read this short interview with Juan Mari Arzak on the essential role of design, creativity and innovation in gastronomic cuisine. 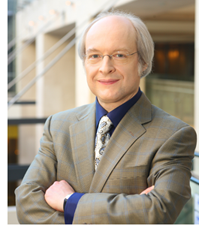 Recently, Jakob Nielsen published one of his Alertbox posts with the title Anybody Can Do Usability. In this post, he made a comparison between cooking and usability. Skill levels form a continuum from beginner to expert. Although multi-star gourmet restaurants are wonderful, there’s also a place in the world for modest neighborhood restaurants. Even if you can afford it, you shouldn’t eat out every day. Sometimes it’s nice to have others do the work. So like cooking, anybody can do usability; the basic methods are simple enough. Two high-order qualities of compelling user experiences revolve around the principles of harmony and balance. People feel at ease experiencing these. Unfortunately, high-order principles aren’t discussed in the user experience domain extensively. Reading this article by Jennifer Farley (Sitepoint) on balance as a design principle and finding this blogpost on Washoku cooking and design by Garr Reynolds (Presentation Zen) inspired me to learn more on how principles of Japanese cooking can improve my designs for experiences. In Japanese cuisine, the Power of Five rules. Five principles outline the ideal components of every meal. Each principle is a list of five items which should all be present for a nutritionally, visually, spiritually balanced meal, with no single component overpowering the others. Harmony in color. Washoku meals include foods that are red, yellow, green, black and white. This is not only visually pleasing, but a great way to be sure you are getting a good nutritional balance with your meal. Harmony in palate. By having a balance of salty, sour, sweet, bitter, and spicy foods, a washoku-style meal is thoroughly satisfying to the entire palate. Harmony in cooking method. 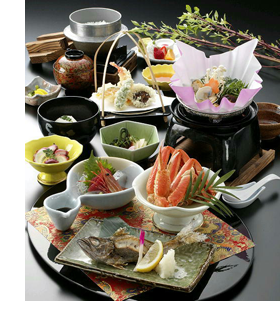 Washoku-style meals use several different methods of cooking in each meal: simmering, searing, steaming, raw, and sauteeing or frying. Harmony in the senses. Each meal should please the five senses: taste, sight, sound, smell and touch (texture). Harmony in the outlook. This is a philisophical idea that when eating we should attempt, first to respect the efforts of all those who contributed their toil to cultivating and preparing our food; second, to do good deeds worthy of receiving such nourishment; third, to come to the table without ire; fourth, to eat for spiritual as well as temporal well-being; and fifth, to be serious in our struggle to attain enlightenment. I immediately ordered her book. The combination of design and food can be very fruitful for people and companies. They get a lot of inspiration from it and take it as metaphor, domain or just for the fun of it. Armin Hofmann from the art blog ‘today and tomorrow‘ reports on one example, the Food Design Probes from consumer electronics company Royal Philips. The Nutrition Monitor. It basically has 3 parts, a sensor which you have to swallow, a scanner which can measure the nutritional value of food and a display device. So you’ll exactly know what your body needs and what kind of effect your food will have on it. The Food Printer. Remember the 3D sugar printer? Well, this is the next generation. The machine brings molecular gastronomy to your kitchen. 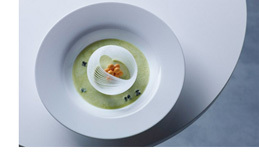 ‘Feed’ is with some ingredients, pick a shape, let it print … and voilà your amazing 3D dish is ready. I can’t wait to see all the opensource 3D recipes that will be available! Let’s see if this consumer electronics company can deliver some great designs from this far-future research and food inspiration. In 2004, Dutch restaurant owner and researcher Peter Klosse wrote an interesting thesis, entitled “The Concept of Flavor Styles to Classify Flavors” at the University of Maastricht (NL). 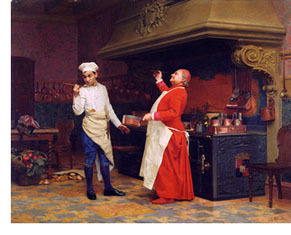 In this thesis, he made a stronge case for a distinction between taste and flavor. His research showed that the taste and richness of flavor are the basis for a classification of flavors. “Before we can objectively discuss taste, we first need to distinguish between taste and flavor. Taste refers to the human act of tasting. It is an intricate experience which involves all the senses. Flavor, however, refers to products. Food and drink have flavors. Making this distinction is important because this allows us to classify taste as subjective: whether you like the taste of a product is similar to whether you like the color red. Flavor then is an objective notion, making classification and assessment possible.”, wrote Peter Klosse in this column. 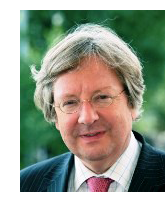 In 1991, Peter Klosse founded the Academy for Gastronomy which is a training institute for food professionals, chefs and sommeliers in The Netherlands. 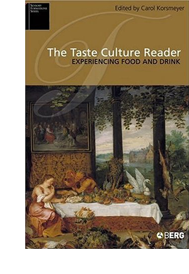 In 2005, editor Carolyn Korsmeyer published the book “The Taste Culture Reader: Experiencing Food and Drink‘ in the serie ‘Sensory Formations’ (Berg Publishers). Besides taste, this serie looks into other senses such as vision, sound and touch. Not in a technology but in a human perspective. In his seminal plenary speech at the Information Architecture Summit 2009 in Memphis (USA), Jesse James Garrett stated that in fact information architects and interaction designers are user experience designers. As designers, they focus on the engagement of people with artifacts, platforms and environments (online and offline). According to Jesse, human engagement involves the mind (cognition), the heart (emotion), the body (action), and the senses (perception). Designers must know how to design for these human capabilities. It almost goes without saying that besides for user experiences, the senses are also crucial for culinary experiences. Tastes, flavors, and smells are important human perceptions of the qualities of food. But are these inherently the qualities of food or are they only emergent through tasting and eating? 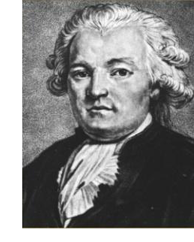 Long ago, the French lawyer and politician Jean Anthelme Brillat de Savarin (1755-1826) wrote an important and celebrated book on the human senses in a gastronomic context: “The Physiology of Taste or Transcendental Gastronomy” (1825). The book contains hardly any recipes but many anecdotes and observations covering all aspects of the pleasures of the table. He is considered ‘the greatest food critic ever’. By reading this book, we gain understanding of our senses. We can use it to what JJG had in mind for user experience designers: facilitating compelling user experiences, never to forget. Great stories are sources of inspiration. That’s one of the reasons we love the 18-minute presentations from the annual TED conference so much. Amazing people telling the most compelling stories. In 2006, 2007 and 2008, a special set of these great stories was told. Robert Mondavi Winery organized the TASTE3 conference and invited storytellers from the culinary world. It’s the passion behind these stories which makes them so inspiring. Chef and scholar Dan Barber relentlessly pursues the stories and reasons behind the foods we grow and eat. Master breadmaker Peter Reinhart channels the science of baking into deep, spiritual lessons and dispels stale myths about the nature (and flavor) of good, wholesome bread. Journalist and author Benjamin Wallace tells the true story of the world’s most expensive bottle of wine. Owner and founder of Vosges Haut-Chocolat Katrina Markoff reveals the four steps that leads her to inspired, delicious and creative new chocolate collections. Moto Restaurant’s Pastry Chef Ben Roche demonstrates the unique dining experience at Moto with his version of Carrot Cake, Nachos and Wine and Food Pairing. Chef Jeffery Henderson tells his story from the streets to the stoves and how cooking changed his life. According to the Taste3 blog, the next version of the conference will be in 2010. Deo volente.